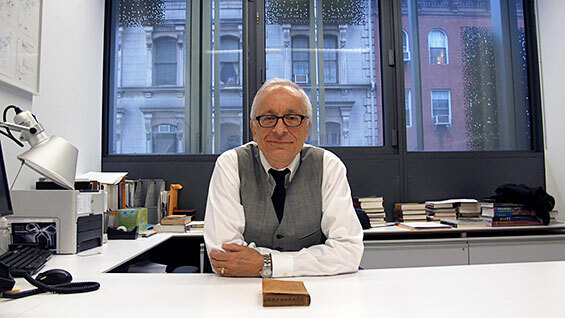 William Germano, Dean of the faculty of the Humanities and Social Sciences (HSS) has the diffucult task of leading the smallest of Cooper Union’s academic staffs to teach the largest body of students. Yet he calls himself “lucky” to be at the helm. As part of the Meet the Deans series, Dean Germano, known as “Bill” to friends and colleagues, expanded on that lucky feeling, his hopes for HSS and even his less well-known musical talents. Born and raised in Yonkers, a suburb north of New York City, Dean Germano, 62, became the first of his family to earn a college degree, majoring in English at Columbia. Following his Ph.D. he began a career in academic publishing, eventually becoming Vice President and Publishing Director of Routledge, Taylor and Francis. A chance meeting at a cocktail party at the Modern Language Association tipped him off to Cooper’s search for a Dean of HSS, and Germano has been leading the faculty there since 2006. He lives on Manhattan’s Upper West Side with his wife, Diane Gibbons. They have a son, Christian, who attends Northeastern as an undergraduate. What are the origins of your interest in writing? I was a pretty good writer in school, though I liked science, too. When I went to college I thought I was going to be a microbiologist. When I got to Columbia I was dazzled by the skills of my classmates in relation to math and the sciences. I realized I was not interested in those things at those levels -- not in a professional way. So I began spending more time in the humanities, a lot with languages, and I majored in English. Words. My first two books [Getting It Published and From Dissertation to Book] were really books about writing. One was about publishing for writers and the other is a book on how to move beyond the dissertation into the book. They’ve been translated. A second edition of the book on dissertation revisions will be out sometime next year. My audience for those books is pretty much scholars. I also write a blog [Lingua Franca] on language that appears twice a month in the Chronicle of Higher Education. It’s pretty hard to find time to write when you have a job like this. You have to be able to construct projects that are based on piecemeal composition. I’ve also got a very small book on a single film – Powell and Pressburger’s The Tales of Hoffmann – coming out in the spring. You also have a book in the works focusing just on opera? That is the book that I have been working on the longest and I keep on interrupting it to write other things. I want to present opera as this rich space for exploring questions about the self and about the relation of music to drama. I want to develop more language that we ---- particularly those of us who gravitate to literature—can use to talk about what I think is the one of the greatest art forms of the west. Writing about opera is tricky because you're either stuck with plot summaries or very dense musicological analysis. The first is boring and the second is inaccessible except to specialists. The space in between is hard to map but I think it's where the fun is. Are you a musician as well as a writer? I’m an earnest amateur. The father of my first piano teacher studied with Liszt, so there are three degrees of separation. Unfortunately those skills don’t get transferred down through handshakes. I still play piano regularly, and have put in my time with choral singing. Point of pride: I’ve played ukulele with Cooper students! I try to make music more visible within our curriculum. For my part, I’m teaching a course on opera this term. This week we were thinking about romanticism and opera and we talked about dreams, gravity, inexpressibility and the weather. Dreams, gravity, inexpressibility and … the weather? Yes because during that period people began thinking of the weather as an artistic subject. The art of J.W.M Turner and Casper David Friedrich are two examples. The attempts to describe storms became an artistic preoccupation. William Wordsworth, in literature, describes his profound experience of looking across a valley. These are quintessentially romantic preoccupations. You can hear it in music as early as Haydn, or Beethoven’s Pastoral Symphony. Composers are interested in meteorological effects as they’re also developing new ways to convey our “internal weather.” We can use that to talk about some of the ways romantic operas of the early 1800's are constructed, and their effects on us. What similarities are there between working in publishing and running an academic faculty? They’re both administrative jobs, first of all. Budgets, schedules, solving problems, meetings. I’d done some university teaching before coming to Cooper, but as my whole working life had been in scholarly publishing I felt I had always been part of the higher ed teaching and learning community. Being Dean requires a number of things, including the enthusiasms of a generalist. My life in scholarly publishing obligated me to have a pretty broad view of a number of fields, some of which I would have never known anything about on a professional level. So I was comfortable with the idea of talking to people from a lot of different areas. Some people are interested in lots of things, some people just aren’t. I’m in the first group. What goals do you have that you hope to be your legacy as Dean? I want to see HSS get bigger and better so that a Cooper education can be even richer. I’d like to see more full time faculty positions within humanities and social sciences, the better to serve our students and to strengthen the professional tracks of the three schools. Of the four faculties, HSS has the smallest budget, and with it I think this faculty works something close to magic. But I’d like to see HSS depend less on magic and more on reliable, expanded resources. I would like to see endowed chairs for the HSS faculty. I would like to see an endowment to support the Writing Center because it's a fantastic resource for the college and does brilliant work. I'd like to see the development of programs that would bring this faculty's work in closer relation to the work of the three Schools. That's a complicated thing, the idea of interdisciplinary programs or programs that are transdisciplinary. But I think if we are going to better serve our students in the 21st century we need to be working towards creating courses, tracks, programs, and emphases that don't replicate everything that's going on elsewhere at other institutions in the city. Spoiler alert: that kind of creative objective is a real challenge given Cooper’s current financial position. Still, I feel incredibly lucky to be at Cooper. First, being at Cooper in any capacity is a chance to work with terrific students. I admit I didn’t know quite how good the students were when I walked in the door, but I learned that fast. Working with these students is luck that I share with a lot of people. Second, I have talented colleagues – faculty, administrators, staff -- whom I admire and whose work is constantly a source of my learning more. Third, I love this city. I have romantic attachments to other locations, too, but New York is New York. But lucky doesn’t mean easy street. Administration isn’t for everybody -- deaning isn’t glamorous. In academia people can’t completely agree on anything, and the academic community is filled with articulate people who tell you what they think. But who wants a boring job? Not me.